Let us relate to you another of her miracles during her lifetime: A young man by the name of Nicholas used to take care of the vineyard of the convent of our venerable mother. Nicholas fell in love with one of the nuns of the convent and could find no peace day or night for desire of this nun. 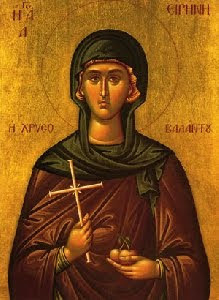 The devil led Nicholas to this passion in order to punish St. Irene. So much did the evil one darken the mind of this young man that one night as he made his way towards the convent he fantasized that he found the gate of the cloister open, went into the cell of this nun, fell down with her on her mattress and did that which he desired. He then actually fell down on the ground and began to grind his body up against the earth. Not only did he cut and bruise his body but he also gave the demon a chance to disturb him. In the morning, the doorkeeper opened the gate of the monastery and noticed him outside possessed, foaming at the mouth and writhing. She went and told our venerable mother what she had seen and asked her if she knew the reason that Nicholas was now possessed. Falling down in prayer, St. Irene said, "Blessed are you O Lord, that you did not allow us to become neither the prey nor the victims of the demons." She then sent the young man to the Church of St. Anastasia to be healed. A few days later Irene saw a vision of St. Anastasia and heard the Great Martyr say to her, "To free yourself from this possessed man you sent him to me? Only you, my sister, can make him well." So, St. Irene ordered that the young man be brought to her. So that no one might learn of her miraculous power St. Irene did not cure the man immediately but rather they tied him to a column of the church. The saint, along with the other sisters, prayed daily for him. When the priest was serving the Divine Liturgy and had put down the holy gifts on the holy table after the Great Entrance the possessed man broke the chain that was binding him and ran into the altar. He grabbed the priest and began to bite his shoulder as if he was actually trying to eat his flesh. Immediately our saint of God rushed to the possessed man and ordered him to remain still. Seeing the saint, Nicholas wanted to run away, but he was not able to move at all being held tighter by the command of the saint than by any chain. When the Liturgy had finished, our venerable mother remained alone in the church with the possessed young man. She prayed to the Lord and then addressed the demon. She ordered the demon to tell her the reason and the manner with which he had entered this man. The demon, forced by divine power, answered all of our saint's questions honestly. She then commanded the demon to come out of the man. Shaking the man and throwing him down to the ground the demon came forth. 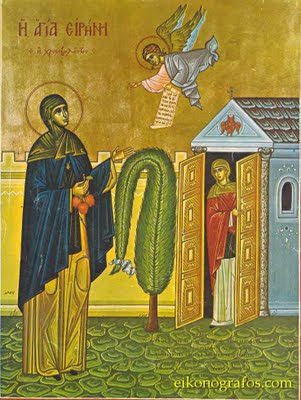 St. Irene raised the man up and advised him as to how to always be careful in avoiding overeating and intoxication, never to be absent from church on any feast day and to pray without ceasing so that the demon might never again get a chance to bother him. When people would ask him, "Who cured you?" he would respond, "The Lord through the prayers of His angels." Nicholas went forth praising and giving thanks to God. * This sudden reversal of the woman's sane behavior to that of one possessed by a demon is explained in the Life of Saint Hilarion the Great (Oct. 21). In a similar situation in his life, a young maiden became a victim of the magical arts perpetrated by a spurned suitor. Smitten in her heart with carnal desire by demonic complicity, she, too, exhibited wild behavior and began to call out the name of the young man whom she now desired. Her relatives took her to that great monastic of the desert, St. Hilarion, who healed her that was bound by some objects upon which a spell was weaved. When the maiden was delivered of this tyranny, St. Hilarion admonished her to take precautions in the future to guard herself against every sin, because unless a demon can use some occasion, he cannot enter into a person. The Saint then addressed some bystanders, saying: "The demons have no authority over us, unless we give them the means. And why do I say unless we give them the means? 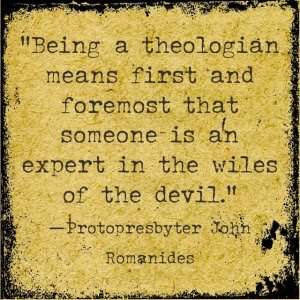 Not even over the unreasoning animals do they have power, unless the Lord permits it, as in the case of Job's possessions [Job 1:11-12] and in other instances mentioned in the Gospel."